Tarah here, from What I Gather, back with another recipe! This Roasted Green Veggies and Grapes recipe is a delicious and nutritious way to enjoy your Spring harvest. 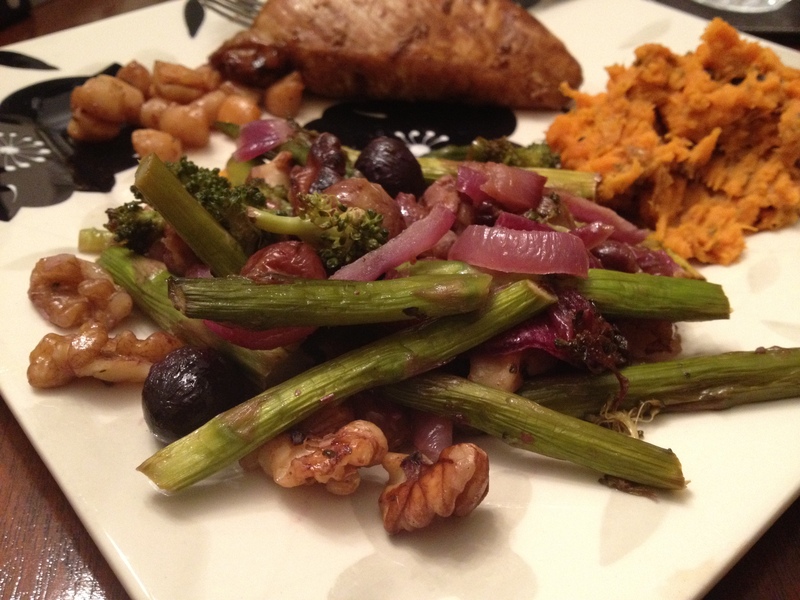 Broccoli, asparagus and onion make a new friend in this dish and his name is Mr. Grape. If you have never tried roasted grapes, you are really missing out. They take on a smoky, sweet quality that pairs well with the vegetables in this recipe. I encourage you to give this one a try, it may just give you the inspiration to pair up some other unlikely ingredients! -Preheat oven to 400 F.
-In a large bowl, toss the broccoli, grapes, onions and asparagus with the olive oil. Season with salt and pepper. -Transfer contents of bowl to a large pan and roast for 15 minutes. -After 15 minutes, add walnuts and stir well. Return to oven for an additional 15 minutes. -When finished cooking, grapes should be blistered and broccoli and asparagus should be just starting to brown.